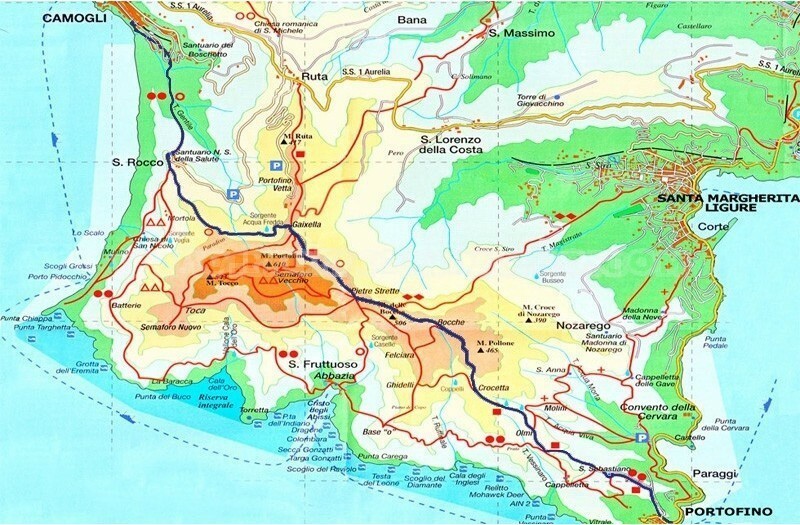 This itinerary includes departure and arrival from Portofino in Camogli, so we recommend the use of public transport for those who chose the train reached the station of Santa Margherita Ligure go in Piazza V. Veneto where, every 20 minutes leave a bus to Portofino. Arriving in Portofino, take the path from the bus stop (opposite the church) rises to the left, a path uphill, very steep at times, which takes us into between high walls where you can glimpse beautiful villas and very well kept gardens . This first part of the journey is accompanied by beautiful views over the bay of Paraggi. The path for vehicles*, broad and well kept, passing from the village of San Sebastian, a small group of houses around a red church, and going up in the middle of the bands comes equipped with a stopping point, where it intersects the path from San Fruttuoso. The climb is now less steep and leaving the beautiful views of the Gulf of Tigullio enters the "Monte" going from places Olmi (250mt. 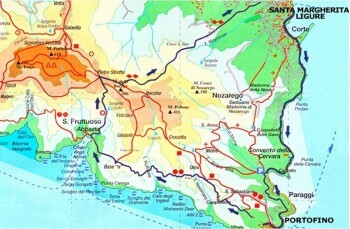 above sea level) (from where the branch to Nozarego), area of "Il Casone" and location "Crocetta "(363mt. asl), equipped with a bench in order to give a break. The path, a slight slope, advancing on the beautiful path of gravel and stone, shaded by magnificent chestnut trees, oaks and pine trees reaching to places Bocche (454 m above sea level. ), A crossroads of many paths and stopping point equipped with tables, benches and drinking tap water. Keeping on the path leading, followed by another break point in the area equipped Pietre Strette (464 mt. 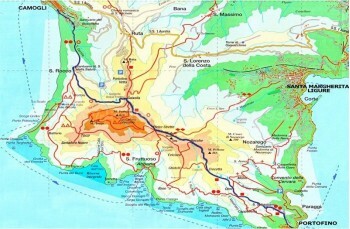 Asl), considered the heart of Portofino. In this stretch of road is worth highlighting a few minutes on the bench, to our right, overlooking Santa Margherita Ligure and San Lorenzo della Costa. 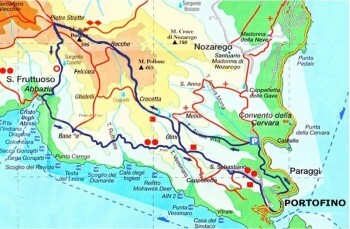 From Pietre Strette continue towards Portofino Vetta, up to Gaixella places (412 mt. Asl) (here's another faucet for drinking water), where you turn left to advancing the shady valley follow the signs for San Rocco Camogli. After the first stretch through the woods, cultivated and fasce descend from the homes of peasants coming to the small group of Galletti, above which, before the eyes open and beautiful scenery of Punta Chiappa, Capo Mele and Paradise Gulf. The descent to Camogli, begins under the square via San Rocco and continues with a series of steps that wind through thick walls and sides, meeting a few houses here and there, after about 25 minutes, along the Rio Gentile, you will enter the parking lot of Camogli. * traveled by motorized scooter or small.